For Christmas everyone likes to serve something special. 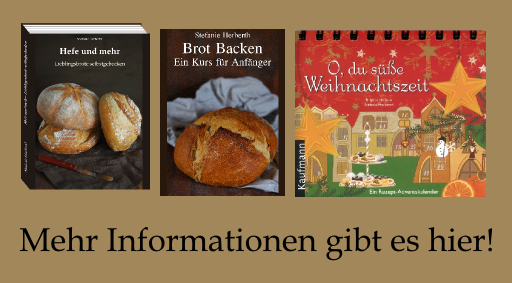 Here at “Hefe und mehr” we are no exception and this includes bread, of course. This year I decided to go for an elegant variation of my favourite combination: nuts and potatoes. For the festive touch I combined walnuts, hazelnuts and pistachios. These nutty flavours are supported by hints of roasted malt and cacao – just enough to add a deepness to its aroma. The bread is risen by my favourite preferment: Sweet starter. And so the bread contains everything you need for a little flavour fire works – again a bread that needs nothing but a bit of butter as spread. The December some haste away so quickly that I want to enjoy my Christmas with the family without distractions. And so I will be not be online during the holidays and answer comments and emails after Christmas. I whish you all a peaceful and merry Christmas! Apple cake is always a good idea. And after sorting my windfall apples I had a small basket of “to use immediately” apples with small dents. 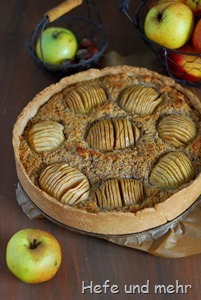 These kind of apples are best in cakes where a beautyful form is not so important, like my alltime favourite apple cake. For the “Zürcher Pfarrhaustorte” (Zurich parsonage cake) I had to select a bit. The good looking halves where used for the apple topping, while the halves with brown spots where grate (of course after removing the brown spots!). The grated apple is then mixed with grounded hazelnuts, sugar and eggs and form so the basic on which I put the halfway sliced apple slices. 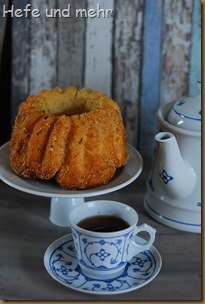 For this cake I found more or less only one recipe in the Net and my recipe continue this as well. I make only minor changes like using my favourite short crust pastry with a bit of buckwheat flour to make the dough a bit more nutty. And I baked the cake longer and at lower temperature to ensure that the apples are all soft and tender. 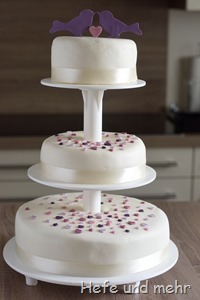 This cake will find its way in my personal favourite folder as it is filling is fruity, moist and not too sweet and can be enjoyed on the next days as well. This week was laborious and exhausting. And add this twelve hour workdays I was happy about the nourishing whole wheat bread that was waiting for me in my lunchbox in the breaks. A soaker made of seeds, nuts and whole wheat flour keeps this bread long moist and fresh while a wheat sourdough adds the desired flavour. As whole wheat sourdough tends to develop more acidity as the white flour variant, I build the sourdough in two stage and let it ferment rather short and warm. 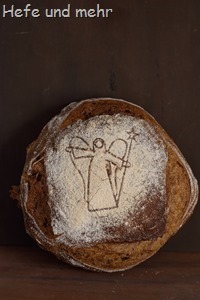 This makes the sourdough strong and mild. 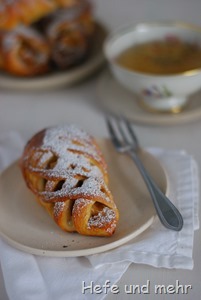 A bit of honey in the dough helps to balance the flavour in a harmonic way. 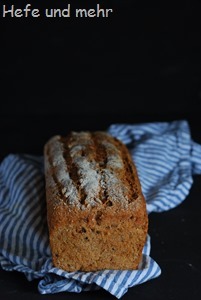 With all the seeds and its sturdiness it is a perfect bread for cold November days. Cornucopia, the horn of plenty, is a symbol of abundance and nourishment in the classical myths and is often associated with autumn. And when I prepared my little pastries I look on the nuts and apples and that little cornucopia would be the right way to celebrate autumn plenty. I love the fact that my sweet Starter enables me to bake more or less spontaneously with a delicious preferment. And when my parents asked us this morning if we want to meet in the afternoon for a cup of coffee I decided to bake a family classic: Goldknödel (Golden Dumplings). The recipe stems from the transsylvanian branch of the family and we all love it. My variant here contains less yeast, a preferment and cream instead of butter. This makes the crumb fluffy and enables me to proof the cake overnight if I want to. But today I choose the fast variant and proofed the cake at room temperature. The cake is served uncut, and everyone can break a piece from it. I like white nougat very much. 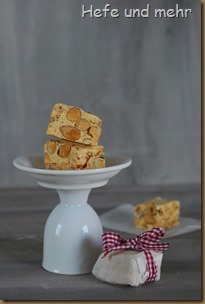 And most I like hart variant, the Turrón Duro. 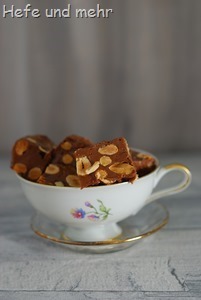 In the last years I tested different recipes but I never found the perfect recipe for me because I always get the soft white nougat. So I optimized the recipe once more this year and was successful at the end. With more sugar, a little bit of invert sirup and and summer flower honey is the nougat not as white as it could be but it is very delicious and just the way I love my nougat! I admired already for some time the gorgeous looking seeded crisps which I saw on different blogs. They sound like a Mixture of biscotti, zwieback and cracker, with a hugh amount of seeds. That was very tempting but every recipe I found used baking powder or soda as rising agent. I don’t like the taste of baking powder so much and so I decided to make a recipe of my own, using yeast instead of baking powder. 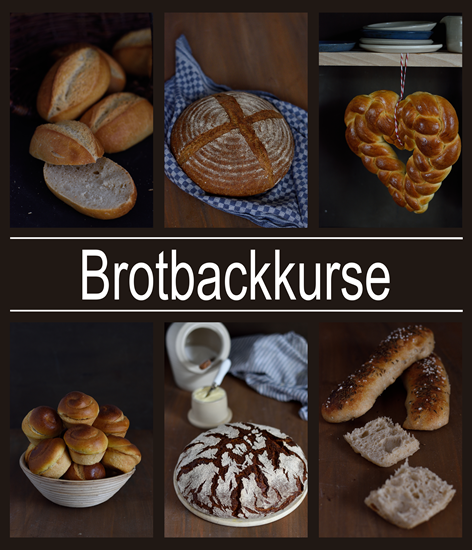 I take my inspirations from different seeded crisps and zwieback recipes. With yoghurt and butter make a tender crumb, honey and malt add a subtle sweetness and the nutty taste comes from a mixture of hazelnuts, sun flower seeds, sesame, pumpkinseeds and buckwheat. After baking the loaf has to cool completly, best over night. Then it is sliced and baked for another 30 min. 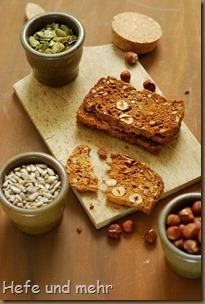 This makes the bread crisp and adds a nice flavour of toasted nuts. The Seeded Crisps are perfect on their own but although great to go with wine and cheese! When August changes into September it marks the beginning of autumn for me. Now I start to search for my scarfs for the already cool, misty mornings and in the evening I will lit the first candles when the light goes down. Saying goodbye to the summer is not so hard for me, especially when between the cool morning and early evening lies a sunny, golden day. 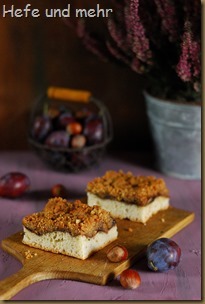 And when I can spent the light filled afternoon with a cup of hot tea together with a pieces of streusel cake filled with the autumn flavours of plum sauce and hazelnuts, then I will welcome autumn light-hearted!